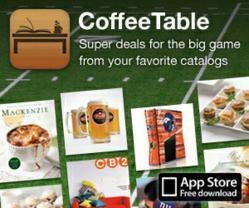 CoffeeTable, the leading retail catalog app for iPad, sees the 2011-2012 holiday season as an inflection point in consumer shopping. CoffeeTable predicts 2012 will be the year that e-commerce will breakthrough its plateau of 10% of consumer spend, driven by mass consumer adoption of tablets as the preferred device for shopping. There’s a difference between discovery and destination... CoffeeTable is the only catalog app that bridges discovery into actual shopping purchases. What if shoppers could skip the mall crowds, and enjoy virtual stores wherever they are? Leading iPad catalog app CoffeeTable is turning shopping on its head, aggregating catalogs from leading retailers in a digital one-stop shop. Just because the mall is closed doesn’t mean the shopping stops: CoffeeTable cites evenings as high-traffic periods, seeing on average 10X increases in unique visitors. Christmas shopping doesn’t end on Christmas anymore: CoffeeTable welcomed more than 2X unique shoppers the week after Christmas vs. the prior week, with shoppers purchasing at levels on par with pre-holiday peak volume. iPad usage has tipped from early adopters to mainstream: The growth in tablet shopping is driven by both new iPad users flocking to shop, as well as existing customers coming back for new promotions from their favorite retailers. Historically, mobile shopping was limited to niche status in e-commerce, due to slow-to-load webpages, security concerns with personal information, and small screens inhibiting detailed product browsing. The $270 billion retail catalog industry – the leading sales channel for most retailers, with carefully designed merchandising and visual page layout – is discovering a new medium with the tablet. With improvements in technology such as the iPad and the introduction of breakthrough interactive apps like CoffeeTable, shoppers can now enjoy a virtual mall experience wherever they are. CoffeeTable features a marquee “showcase” of dozens of catalogs, customizable subscriptions, exclusive promotions, and the only secure in-app shopping experience with its “Express Checkout”. For more information visit CoffeeTable on the web or download for free from the iTunes App Store. CoffeeTable is a free shopping app that turns your iPad into a virtual coffee table of retail catalogs, allowing shoppers to browse their favorite stores anywhere, anytime. It is the only app that enables purchases to be made directly in the app, via its Express Checkout technology. CoffeeTable features rich visual catalogs of leading retailers such as Crate and Barrel, Sears, west elm, and many more. CoffeeTable is the brainchild of e-tailing pioneers Chris Friedland and David Berman. Friedland and Berman are founders of Build.com, a $300 million e-commerce business. CEO Ben Choi is Venture Partner at Maveron, and is a seasoned mobile executive, formerly at Greystripe (acquired by ValueClick) and at Yahoo.